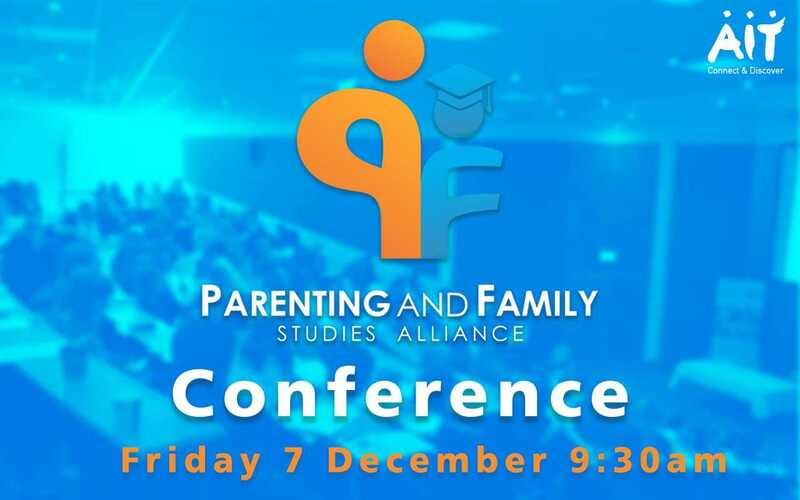 The Parenting and Family Studies Alliance, an organisation comprising three institutes of technology, will be hosting a conference in Athlone Institute of Technology on Friday 7th December entitled ‘Parenting Well in Modern Ireland - Challenges, Rewards and Growth’. The free half-day conference will be divided into two sections - ‘The Social Context of Parenting’ and ‘Parenting Life’ – covering topics such as the effect of separation and divorce on maternal responsibility and contemporary fatherhood, and will interest those who work with families in the community and voluntary sector, as well those in related areas of family support (students are also encouraged to attend). Kicking off the conference, representatives from the Vincentian Partnership for Social Justice (VPSJ), Dr Bernadette McMahon and Olivia McEvoy will collectively unpack stories of struggle and the experiences of people living below the ‘minimum essential standard of living’. An NGO working for social and economic change, VPSJ works to promote active citizenship among communities in disadvantaged areas and to establish content (goods and services) expenditure and income necessary for a minimum essential standard of living. Dr McMahon, who has been the director of VPSJ since its establishment in 1995, is also a member of the Living Wage Technical Group in the Republic of Ireland, the UK Minimum Income Standards Network and the Irish representative on the EU Platform on Reference Budgets. Her colleague, Ms McEvoy, is a researcher in the VPSJ centre for Minimum Essential Budget Standards. Her work establishes negotiated consensus on what households believe is required for a Minimum Essential Standard of Living, using the Consensual Budget Standard methodology to produce its data set, which now covers 90% of households in Ireland. Parenting and Family Studies Alliance organisers Dr Colm O’ Doherty and Dr Ashling Jackson will jointly discuss the value of the Irish ‘Family Life Education’ framework. Dr O’Doherty, who lectures in Applied Social Studies at Tralee IT, is an established social work practitioner in Ireland, England and Wales. He has written and published widely on topics such as family support and social capital, which are directly applicable to positive community development practice. Several of these titles have been co-authored with his contemporary Dr Jackson, who, herself, is a senior lecturer in Social Care at Athlone Institute of Technology. Dr Jackson has worked extensively with groups experiencing social disadvantage in community settings, including the Traveller community, and is currently the co-editor of the Irish Journal of Applied Social Studies. Director of the Katherine Howard Foundation (KHF) Dr Noelle Spring will also be in attendance to discuss parental supports. A graduate of both Trinity College Dublin and St Patrick’s College Dublin, Dr Spring has worked with KHF in the capacity of director since 1999. Her interests lie in improving the lives of young children and their families through the development of policy and practice, particularly in the early years and family support sectors. Discussing women’s experiences of maternal responsibilities after separation and divorce, Dr Michelle Millar, head of the School of Political Science and Sociology, NUI Galway and Dr Rosemary Crosse, a researcher at the UNESCO Child and Family Research Centre, will also be presenting at the conference. Dr Millar is a Principal Investigator on several funded research projects, the most recent an IRC Social Protection Research Innovation Award. Her research interest focuses on labour market activation and those parenting alone as well as social inclusion and parenting while the effects of marital dissolution on Irish mothers formed the basis of Dr Crosse’s doctoral thesis. A Senior Research Fellow at the School of Education, Trinity College Dublin, Dr Michelle Share has been invited to speak about the prevalence of transnational grandparenting, particularly as it pertains to Polish families living in Ireland. Dr Share has researched and published extensively on the role of grandparents in childcare provision; children and parents who use intellectual disability services; educational access programmes at second and third level; and on young people food and nutrition in second level and alternative education settings. She was also the principal investigator on a study of transnational grandparenting among Polish families in Ireland. In the latter half of the session, Traveller Primary Health Care Worker, Sarah McDonagh and Pauline Clarke Orohoe will be speaking about parenting values among Traveller families, paying particular attention to values, attitudes and practices. The former has worked as a Peer Community Health Worker with the Primary Healthcare Programme for Travellers in Offaly for the past 19 years. She also delivers outreach health promotion initiatives to Travellers within their own community and is particularly interested in working to improve mental health supports for Travellers. Her colleague Pauline is a Project Leader with the Barnardos Lir Family Support Project and is currently studying for an MA in Applied Social Studies (Social Care) (research) in Athlone Institute of Technology. Closing the conference, Dr Noel Richardson, Lecturer and Director of healthCORE, IT Carlow will be discussing contemporary fatherhood and what that looks like in the context of a modern Ireland. Dr Richardson has extensive experience in men’s health at a research, policy and advocacy level and is currently collaborating with the World Health Organisation (WHO) on the writing of Men’s Health Strategy for the WHO European Region. Dr Richardson research interests include men’s health policy, gender and health, mental health and suicide prevention in men, and health promotion targeted at ‘hard to reach’ population groups of men. Established in September 2015, the Parenting and Family Studies Alliance aims to promote and facilitate critical inquiry into the changing nature of parenting and family life in modern society. The Alliance consists of three members – Athlone Institute of Technology (AIT), Institute of Technology Tralee (ITT) and Institute of Technology Carlow and is co-ordinated by Dr Ashling Jackson, Dr Colm O’Doherty, Dr Noel Richardson. Register your interest for the free, half-day Parenting and Family Studies Alliance Conference.